NIA-CHARLESTOWN NEVIS (January 24, 2011) — Two residents on Nevis, Mr. Ron Daniel and Mr. Oscar Browne, gave their unwavering support for the 2011 Population and Housing Census which was officially launched in Charlestown on January 20th. The data collection exercise will commence in April through May, however the launch signalled the start of a public awareness exercise by the Ministry of Finance Statistics and Economic Planning in the Nevis Island Administration. 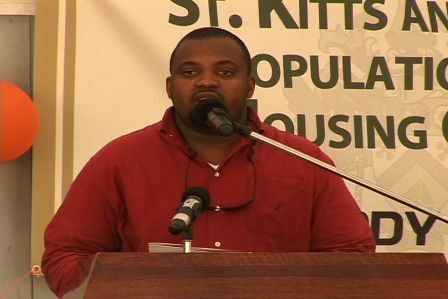 During his endorsement pitch, Helping Our People Excel (H.O.P.E) Nevis’ Representative Mr. Daniel, said he was hopeful that the dater compiled from the Census would be published and disseminated locally and as far and wide as possible. “As a student of the social sciences myself, it would be interesting to find out what the final results are. It is important that this data is published far and wide and that adequate use be made of local print, electronic and social media such as Facebook [internet social network] and so on for these statistics. “Just as the Valued Added Tax Office has a Facebook page, I am sure that I speak for all the young people when we say that we expect the Statistics Office to have a Facebook page that we can interact with from the comfort of our homes. I expect these statistics to reach every primary and high school in Nevis as well as the community libraries that have been recently set up by the NIA in the community centres,” he said. He said it was with a sense of pride he gave the highest commendation for the launch of the 2011 Census, and initiative of the Department of Statistics that would provide greater statistical data on Nevis which had been lacking. Mr. Daniel said he was pleased that the Census would not only all provide date on the population of Nevis but also cover issues that related to employment among others. The verifiable data was important for any government, group or private organisation to work with in order to implement effective programmes. However, he was hopeful that at the end of the exercise the Department of Statistics would not cease activity but continue to research and publish in order to keep the public abreast of the changes that were ongoing in Nevis. Mr. Daniel noted that Nevis had changed much since the last census in 2001 and there were undoubtedly more people, different professions and more houses to cover and offered recommendations of his own. “Might I suggest to the Department of Statistics, that when they are searching for people to carrying out the census that they look firstly to the members of HOPE to assist them. It is important that we include the young people of Nevis in this important information learning exercise. “On behalf of HOPE Nevis, I want to fully endorse this exercise, urge the People of Nevis to cooperate with the Department and hope that the Department would take our humble suggestions on board,” she said. Reigning Culturama Kaiso King on Nevis Mr. Browne in his endorsement referred to the census as a very important and valuable exercise and encouraged all to cooperate and participate when the enumerators came in search of the necessary information.